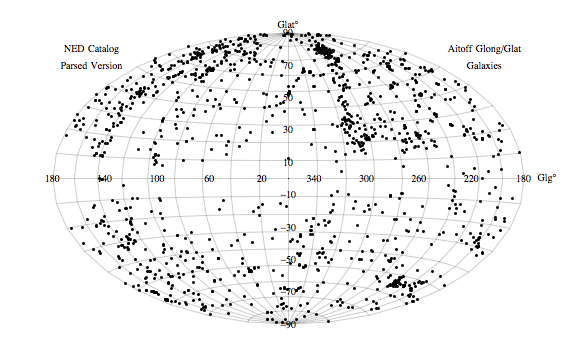 The figure below shows the positions of more than a thousand galaxies in the universe. You might think that tells us things about the history and evolution of the universe, and you’d be right. But it also tells us something about how we observe the universe. Knowing the latter is important, because all measurements have biases. If you don’t account for observation biases, you might mis-interpret your data. For example, you’ll notice there aren’t many galaxies along the horizontal center line. This doesn’t represent a huge “void” in the universe, but rather is a clear example of observation bias. These galaxies are plotted in galactic coordinates, a coordinate system where the “equator” lies in the plane of our galaxy. This is why you don’t see many galaxies near the center line of this figure. The galaxies were observed in the visible spectrum, and the gas and dust of the Milky Way absorbs visible light, therefore making galaxies along the galactic equator hard to observe. It’s also important to recognize that biased data is not worthless data. Knowing the method of observation tells us we can trust the observed distribution of galaxies in the regions away from the equatorial plane, but not near the equatorial plane. There are other biases in this graph as well. For example, this is only a plot of visibly bright galaxies for which we also have redshift data, so there is a “proximity” bias where more of the galaxies are nearby rather than distant. There are also “bands” of observed galaxies due to the fact that telescopes track through the sky, and it is easier to observe galaxies along a track rather than randomly positioning your telescope. Of course we can account for those biases as well. Good science is not just gathering data, but understanding how that data is gathered. We all have a biased view. The trick is to recognize our biases and deal with them accordingly.